Photodynamic therapy (PDT) is a type of treatment for precancerous skin growths called actinic keratoses. This treatment combines the use of a topical medical with a source of light. The topical medication used in this treatment is a photosensitizer. The photosentizing agent used in PDT at Hancock Dermatology is aminolevulinic acid. 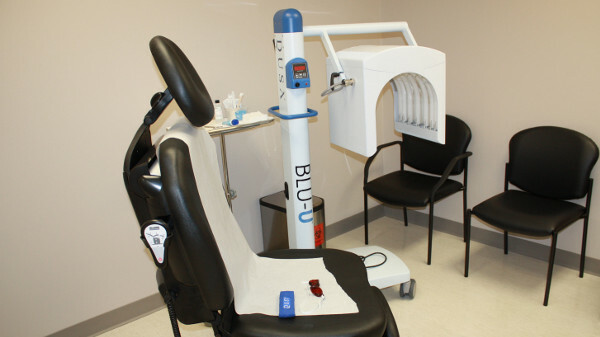 The light source used at Hancock Dermatology is the BLU-U light. This light may also be used for the treatment of acne. Aminolevulinic acid is a solution used to treat actinic keratoses and superficial basal cell carcinomas. It is used with Blue light. Once this photosensitizing medication is activated by light of a specific wavelength, they react with oxygen and kill cancerous and precancerous cells. BLU-U is a visible light spectrum and is not UV or cancer causing wavelength. Goggles will be worn during the procedure to protect the eyes. The light runs for nearly 17 minutes. The blue light penetrates the top 2mm of skin where most precancerous lesions are found. The U shape of the light allows for optimal treatment of the entire face and scalp. Laser light is sometimes used in PDT. Because of laser properties, laser light may be more suitable for the treatment of small skin lesions. LEDs are also used as sources of light for PDT. Because of their large field of illumination they are better suited for the treatment of large skin lesions. LEDs that emit polychromatic light of different wavelengths are the better option when several photosensitizers are used. Natural daylight has also been used as a source of light for PDT in the treatment of actinic keratoses but this methoad has not been approved in the United States. Step 1: The photosensitizing agent (levulan) is applied to the skin. In some circumstances the skin is gently scrapped with a sharp spoon-like object known as a curette to increase the amount of medication that is absorbed. Step 2: This step a waiting period which gives the photosensitizing agent time to be absorbed by the skin. The medicine absorbs more into the cells of the cancers and precancerous growths than into normal cells. This is beneficial because it minimizes damage to the surrounding healthy tissues. The waiting period is usually between 1 and 2 hours. Step 3: Light from the BLU-U is shone on the area to be treated. The light activates the photosensitizing agent and through a photochemical reaction that involves oxygen and it kills the cancerous cells and damages blood vessels in the tumor. This step usually takes 16 minutes and 40 seconds. Cool compresses and fans can be used to releive any discomfort. Discomfort is usally mild but varies by individual. Some burning and stining is experienced by moist patients.After treatment, the treated skin is then covered with a thick sunscreen to protect it from exposure to light. In some situations, another cycle of Step 1 to 3 may be repeated after one week. Step 4: A sunburn like reaction and sometimes tenderness develops in the treatment area. This occurs as the damaged cells are dying off. The reaction usally heals in 1 to 2 weeks or less. Sometimes mild peeling is the only symptom. After treatment, the skin should feel more smooth. Actinic keratoses which are are precancerous spots that develop on the face and scalp as a result of chronic sun exposure. PDT is used for facial rejuvenation in persons with photoaging. PDT can be used on its own to treat these conditions or it can be combined with other therapies like surgery, radiation therapy and topical chemotherapy. Sun Sensitivity, the topical medication used in PDT can cause sun sensitivity after the treatment. This photosensitivity resolves within 48 hours and may result in burning and stinging sensations in the skin. There may also be swelling, redness, crusting, itchiness, peeling and blisters. Skin infections, in some situations, skin infections may develop. Hypopigmentation or loss of pigmentation can develop.